A great puzzler series featuring another robot hero. Perhaps you'll say he's no Mega Man, but he's still pretty cool. He just has a slightly different method of saving the world. Check out all his games! Bomberman is a robot engaged in the production of bombs. Like his fellow robots, he had been put to work in an underground compound by evil forces. He found it to be an unbearably dreary existence. One day, he heard an encouraging rumor. According to the rumor, any robot that could escape the underground compound and make it to the surface could become human. Our hero leaped at the opportunity, but escape proved to be no small task. Alerted to his betrayal, large numbers of the enemy set out in pursuit. He can rely on bombs of his own production for his defense. Will he ever make it up to the surface? Once there, will he really become human? --From the NES Bomberman instruction manual. Blow up everything! Well, except yourself, and that gets harder and harder. Blow up walls and bad guys. Collect cool bomb upgrades that allow you to drop more than one bomb at a time, or give you a bigger explosion thus allowing you to destroy more blocks faster. This is a birds eye view style game with a grid of blocks that cannot be destroyed. The game spawns a few enemies and random blocks filling in certain areas of the map. As you play you blow up blocks to open up parts of the map and hopefully corner your enemies so you can destroy them. The level exits are found by blowing up the bricks as are the power ups. The enemies look really surprised when they die, it's funny. Most of the sound effects are your standard bleeps and blips but the explosion sound is pretty good. There are 8 different enemies and each one has its own movement pattern. If you can defeat all of the enemies with 7 or less bombs your score will be higher. Valcom, looks like a lightbulb with eyes. Worth 100 points. O'Neal, looks like a tomatoe with feet. Worth 200 points. Dahl, a rectangle with horizontal lines. 400 points. Minvo, a happy face with a big grin. 800 points. Ovape, looks like one of the pacman ghosts. 100 points. Doria, a bubble cloud type creature, 2000 points. Pass, an angry tiger face, 4000 points. Pontan, a not so happy face, 8000 points. A bonus level is given after every five levels. The goal is to kill as many bad guys as you can in a limited time. On these levels Bomberman cannot be hurt by bomb explosions so use as much as you can! 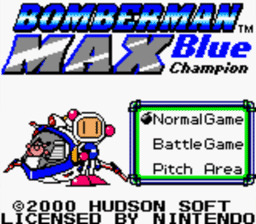 Sequel to the Game Boy Color titles, Bomberman Max 2 is also available in two versions: Blue and Red. 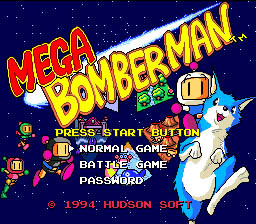 Playing as either Bomberman (Blue version) or Max (Red version), players must once again battle the infamous Hige Hige bandits who have shrunk Bomberman and Max to the size of ants using their secret "Mini Mini" device. 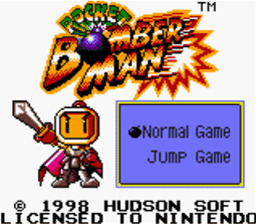 In order to return to their normal size, Bomberman and Max must drop bombs, complete puzzles, and destroy the devious shrinking device of their adversaries. Throughout the game, players collect, raise, and breed Charabom characters, then battle them against one another by utilizing the Link Cable. --From the Gameboy Advance Bomberman Max 2 Blue Advance instruction manual. 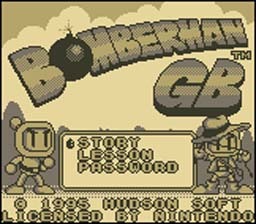 The universally loved Bomberman finally makes his appearance on the Gameboy Advance console in "Bomberman Max 2 Blue Advance". Gamers familiar with the previous editions of Bomberman will find themselves right at home as they navigate 100 puzzle stages with the aid of the new Charabom characters, monsters that Bomberman rides and can use to execute special powers. Bomberman has been shrunk and must complete the stages if he ever hopes to return to his previous stature. The player navigates Bomberman through puzzle like stages, using his bombs to clear obstructions (and enemies), and pass to the next stage. I remember playing "Bomberman" for the original NES, it was one of my favorite games ever. "Bomberman Max 2 Blue Advance" departs from the original by focusing the game experience on a single player puzzle campaign as opposed to the multi-player battles of old. The shift was perfect for the Gameboy Advance system. 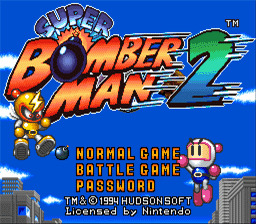 The gameplay still feels like a typical "Bomberman" title, featuring simple but effective game mechanics presented in an approachable design. The addition of the Charabom characters and a plethora of items deepen the game experience, and compel players to use some strategy. All of the Charaboms have different abilities that can be utilized at any point of the stage. The graphics are likely to blow players away with rich, bright colors, and exceptionally crisp levels. The music and sound effects are catchy and help pull the player into the gaming experience. "Bomberman Max 2 Blue Advance" will satisfy fans of the franchise, and those who have yet to be introduced to the Bomberman series. --From the Gameboy Advance Bomberman Max 2 Red Advance instruction manual. 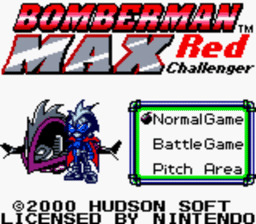 "Bomberman Max 2 Red Advance" is identical to "Bomberman Max 2 Blue Advance", except that the player controls the Max character as opposed to Bomberman, and a few of the later levels are different than Blue version. Because the graphics, mechanics, story, engine, and items are all identical, I thought it prudent to replicate my review of the Blue version, as my perspective on the two games (and the games themselves) is identical. I have changed the referenced game to "Red Advance" in this review to prevent confusion. The universally loved Bomberman finally makes his appearance on the Gameboy Advance console in "Bomberman Max 2 Red Advance". Gamers familiar with the previous editions of Bomberman will find themselves right at home as they navigate 100 puzzle stages with the aid of the new Charabom characters, monsters that Max rides and can use to execute special powers. Max has been shrunk and must complete the stages if he ever hopes to return to his previous stature. The player navigates Max through puzzle like stages, using his bombs to clear obstructions (and enemies), and pass to the next stage. 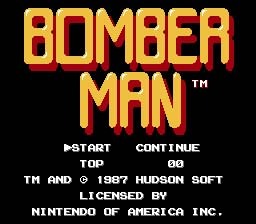 I remember playing "Bomberman" for the original NES, it was one of my favorite games ever. "Bomberman Max 2 Red Advance" departs from the original by focusing the game experience on a single player puzzle campaign as opposed to the multi-player battles of old. The shift was perfect for the Gameboy Advance system. 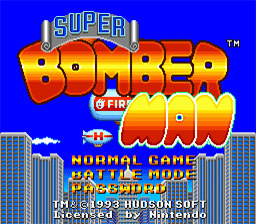 The gameplay still feels like a typical "Bomberman" title, featuring simple but effective game mechanics presented in an approachable design. The addition of the Charabom characters and a plethora of items deepen the game experience, and compel players to use some strategy. All of the Charaboms have different abilities that can be utilized at any point of the stage. The graphics are likely to blow players away with rich, bright colors, and exceptionally crisp levels. The music and sound effects are catchy and help pull the player into the gaming experience. "Bomberman Max 2 Red Advance" will satisfy fans of the franchise, and those who have yet to be introduced to the Bomberman series. ...and a warrior of light, Bomberman stands ready to defend the universe against the mysterious organization seeking to mechanize all life. A passionate crusader, ever willing to fight for a cause, he will not rest until he has saved all the Charaboms in danger. A master of explosives, Bomberman uses his trademark bombs to blast away any evil that stands in his way. At the far end of the galaxy there were 5 stars. Each star had its own life forms and background. One of the stars was a mecha world, that guarded all the other stars. The Brain, a supercomputer, controlled all the defenses. But one day a mysterious virus infected the Brain. The computer went nuts and started turning all the other stars to lifeless planets. Far away from the Brain was a research outpost, Dr. Ein tracked the computers malfunction, and sent Bomberman and Max to shutdown the evil computers to save the unique charabom's living on the planet. The Bomber Base has received an SOS from the cosmos, signaling that Planet Phantarion is under distress. In response, Bomberman Max is quickly dispatched to investigate the planet's plight. But when all transmissions to Bomberman Max fail, it becomes clear that the evil powers of Phantarion's phantom menace have befallen our super hero as well. Now Phantarion's last hope is the original Bomberman...can he solve the mystery and rescue Max in time? --From the Gameboy Advance Bomberman Tournament instruction manual. Imagine a world where three of the most beloved videogame franchises in history were somehow fused in a furnace fueled by fanatic fan fervor. Now open your eyes and quake puny mortal, for "Bomberman Tournament" has arrived! One part Bomberman, one part Zelda, and one part Pokemon, "Bomberman Tournament" uses the best aspects of its ingredients to a very entertaining effect. "Bomberman Tournament" features the multi-player mode that made it famous, but goes further in developing a single-player quest driven story mode that makes this title a real contender for best Gameboy Advance game ever. After discovering "Bomberman Tournament" in the Console Classix catalogue, the same question kept nagging at me, how did I not know about this game?! There are great number of "Bomberman" games available for a range of systems, many of which I'm sure are not familiar to me, but "Bomberman Tournament's" quest driven single player mode is unique to the franchise, and stellar all around. The overhead 2-D graphics are unbelievably detailed, and colorful, the music is catchy, almost giving the impression of an updated Legend of Zelda title, except with Bomberman of course. The stages are tackled Bomberman style, meaning the player will be using bombs to dispatch enemies and remove obstructions for Bomberman's path. In "Bomberman Tournament", players will have to interact with NPCs, fulfilling their quests and collecting items along the way. During their interactions with NPCs, players will have the chance to upgrade and modify their bombs, and collect other weapons. The addition of the Karabons (Pokemon like creatures) was a huge step in terms of depth and content. There are over 25 Karabons that Bomberman can use to fight for him. Each Karabon has unique abilities and statistics that can be leveled up. The Karabon fights are very similar to Pokemon battles, and take place in a 2-D side view. The addition of Karabons was really surprising for me because Bomberman seemed to already have a winning formula, so why take such drastic steps to add different aspects of gameplay and mechanics? Why risk making an RPG with Bomberman instead of the traditional multi-player battlemode? Whatever Hudson Soft's reasons, the gamers are definitely benefitting from the risks that taken in developing this instant classic. "Bomberman Tournament" is my new favorite addiction in the Console Classix catalogue of games, and I'm betting it will soon become yours as well. BOOM! Here it is! This frantic arcade classic is a guaranteed blast. Bomb your way around scrolling mazes collecting power-ups in search of the magical locket. Or plug-in up to 4 Players to unleash a hugely addictive blast-a-thon of multiplay mayhem! The game intro shows the Earth being broken into five pieces. The point of the game is to gain pieces of medallions by defeating all enemies in every world. When you collect all the pieces, you then fight a boss (by blowing him up, obviously). When you defeat him, that slice of the world will return to where it should be. The graphics are fun and bright. This is much more fun to look at than the original Bomberman, though perhaps a bit more difficult to control. The music is more sophisticated than the original Bomberman as well, but I must say I loved that corny old music. Still, this music isn't bad. Long, long ago, the sun was shrouded by a dark and sinister cloud. Within seconds, darkness spread across the land. No longer could the sun reach the hills and valleys of the beautiful landscape. An old legend told that the cause for the appearance of the cloud was a huge monster. That ugly creature laid a curse on the legendary "Sword of the Sun" and sealed its power. Now you are the only hope for the empire. Climb the "Evil Mountain" and collect the five "Power Stones" to break the curse of the sword. Each stone is guarded by a cruel monster which you must defeat in an intensive battle. Start your quest with only your wits plus a few bombs to protect you, and bring back the sunlight to your country. Pocket Bomberman is not quite like other Bomberman titles. Instead of the classic overhead view of a maze, this time the levels are side-view, and you can jump from platform to platform. Use your bombs to destroy enemies, uncover power-up items to make your task easier, and finally defeat all the monsters to save the day! Far to the north of BomberMan's hometown, Peace Town, lies the modern metropolis Diamond City. There, the evil Carat Diamond and his cohort, scientist Dr. Mook, are holding a Robot Tournament with robots specially designed for their combat and offensive capabilities. Hoping to steal BomberMan's advanced combat capabilities, Diamond has created a fake BomberMan to go to Peace Town and kidnap the real BomberMan. Aware of Diamond's plot, Black BomberMan heads out alone to face the fake BomberMan. But Black BomberMan is defeated and his castle is taken. Somehow Black BomberMan escapes and seeks refuge with White BomberMan, and warns him of Diamond's evil plan. Soon, wave upon wave of enemy robots begin their advance toward Peace Town. Now our heroes must join forces to overthrow the evil Diamond!! Once again, BomberMan takes on all comers in a new challenge of nerves and skill. Destroy your enemies before they destroy you, and find the exit before time runs out! Now making the series debut on the Super Nintendo, Super BomberMan is all new with improved graphics and sound effects, plus all kinds of new features, power-ups, game modes, and all kinds of fun stuff. So get going, try Super BomberMan today! Will BomberMan ever see an end to all this fighting!? --From the Super Nintendo Super Bomberman 2 instruction manual.